As the weather gets colder, I have been increasingly aware of the humanure pile freezing up for another season. This past summer I had been emptying our buckets into a smaller trailer I had purchased LAST year for just this purpose. I was unimpressed with having to muck out the entire half of the hacienda in one go. Donna wasn't a fan of the small trailer experiment. She felt that we were emptying out perfectly good "pre" compost down into the ravine - I can't say I entirely disagreed, although because it was my idea, I was willing to try to nurture it a bit more. In the end though, I think I agree. It has never been easy to empty the trailer. Yesterday I decided to empty it once again in the ravine. It wasn't all that fun. Then I returned to the hacienda to begin mucking out the pile that was left from two years ago (I alternate between the two halves each year). This was not bad at all really. It just took about 6 or 7 trips, that's all, but I put on a podcast and my headphones, and found an easier and easier system each trip. Eventually I came down to filling the trailer, taking it out into the wilds beyond our garden, and simply opening the back of the trailer and dumping it. Then I would drive around in a loop back to the beginning of my trail, where I would replace the back of the trailer and lock it horizontal for another trip to the humanure hacienda. Hard to tell this isn't normal soil - just dumped in the low areas around the garden. Another view of the trench I was filling. This was not an unpleasant job at all, and didn't take overly long in the grand scheme of things. As such, I think that going forward, this will be my choice for how to deal with things. Now I have a smaller trailer that can be dedicated for this task, plus perhaps smaller loads that I want to dump. Emptying out the left hand (2 year old) side. Emptied - plus one fresh "dump" from the cabin. A year old - and tonnes of volunteer tomatoes! A fair while ago Donna had purchased a large bag of soapnuts. They are advertised as being a natural alternative to many soaps in the household. So far we have been using them mostly for laundry, but I did fill a small bottle for Kenny to try using in the sauna (I wondered if maybe they would be "no more tears" sort of gentle, as well as something more natural than most commercially prepared soaps). Unfortunately, after a bit Kenny decided that he didn't like the smell (seems mild enough to me) or the texture. Admittedly, they don't quite get as lathery as commercial soaps, but a bit of research seems to indicate that the lather is purely psychological anyway. So back to laundry for the soap nuts. I started cooking up a litre of the mixture at a time, using the rice cooker during off-times of appliance use. Donna noticed occasional black deposits inside the container I was storing it in, and pointed out that she had read that you really shouldn't keep the prepared mixture of soap nuts around for more than two or three weeks, as it had the potential to go off, or grow mold, or explode, or something that I wasn't paying much attention to. When Kenny and I arrived home from our rather extensive back-to-back dental appointments, the sun was shining reasonably well, and we had a couple hours left before sundown, so I thought I would take a crack at it. Especially since the processing time at pressure was a laughable fifteen minutes. Start out with my head assistant at Burger Barn. Return home and begin assembling jars and setting up canning station. Place four or five pieces of soapnut in each jar. Half fill with room temperature water. Add a splash of vinegar to the canning vessel to prevent any possible scale buildup. Top up jars with boiling water to facilitate reaching proper temperature in the canning vessel. Add Tattler lids, rings, and place in canning vessel, along with another half litre of boiling water. Note the staggered position of the jars to help ensure more uniform steam exposure. Crank up to 1000 watts to try to encourage boiling. Add a jar of crystalized honey to take advantage of the warmth. Grow impatient as the button doesn't pop up quickly enough. But still make sure you get 10 minutes of steam escaping. Crank up to 1800 watts until the button pops up. Then dial back to 700 watts sheepishly. Set timer for 15 minutes once steam starts. Wait for button to drop again after power shuts off. N.B. liquid honey again! Enjoy the cans of soap! Looks good. I'll have to run it through a sieve before I can use it though. 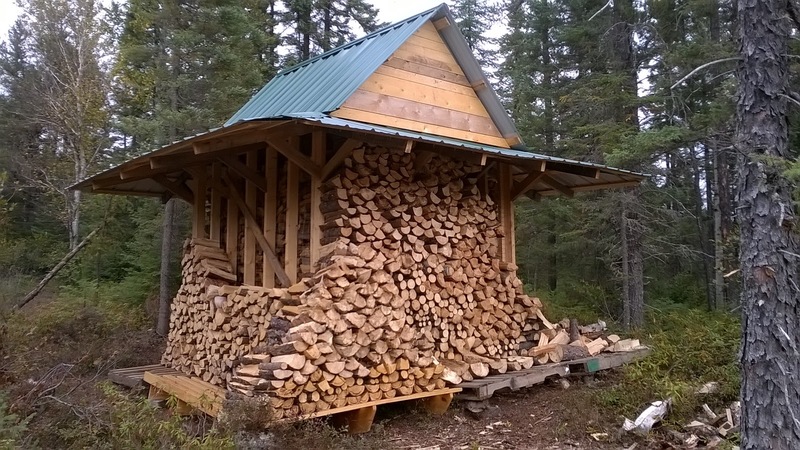 Well, I spent my bread labour yesterday cutting, splitting, and piling the pile of logs I had accumulated by the woodshed over the past week. Grandpa had earlier made a beautiful pile that I continued. A view from the corner, showing the wood creeping up the outsides. But alas, later in the afternoon, Donna went out to capture this disappointing picture. Note the collapse on the right and pile on the lower right side of the picture. A few days ago, Grandpa declared that he was going to put in a new, short side trail to some jack pines that had been killed by a porcupine. Yesterday he finished the trail and cut up some smaller deadwood that he deemed suitable for firewood. As such, today I took the ATV and trailer up his new trail and loaded up. On the way back, I took a corner too sharply on a slope, and dumped the trailer :(. But it wasn't a big deal to set it right and reload it. I got the wood back to the shed without incident, and Grandpa began splitting it. Grandpa gets right to it! 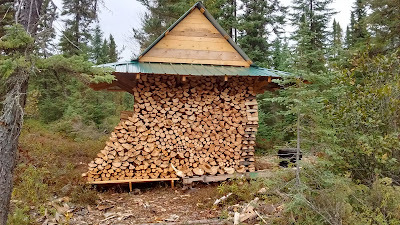 I had a number of other miscellaneous logs in the area that I had skidded last week, so I took advantage of the nice weather to cut them up into stove length and create another pile of wood "to be split". Putting my best face forward. Longer ones I'd buck up well off the ground, as long as I could still lift them. Hopefully he'll find something worth posting again soon. He's been so busy! 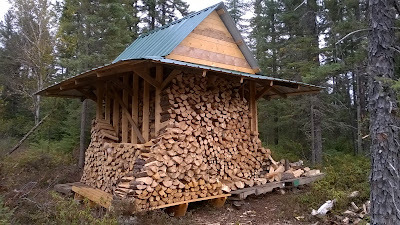 At least the woodshed is even more full than before! Capacity - here we come! The outer pile grows nicely! Halfway up the door frame! 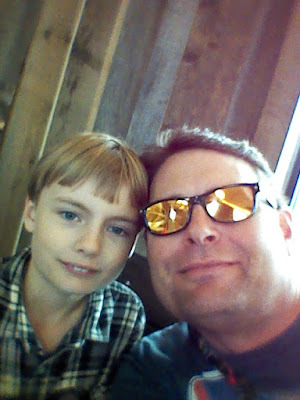 Over the course of the summer, while enjoying the steam of the sauna, I became increasingly agitated as I noticed that the wood paneling on the wall directly over the stove was getting steadily darker. I examined it in the daylight with a flashlight and could see that it was clearly darker than the rest. I began to imagine the wood suddenly spontaneously combusting and burning down the sauna - often my imaginings place me in it while it happened! Sorry for not taking any "in progress" pictures - but my official photographer was away at work, and I get too wrapped up in my projects some days to remember to record them. At first I dismantled the steel that I originally had used to replace the concrete board. Underneath, on the inside, I noted extensive charring of the edge of the paneling and beams of the sauna. I packed this area with Roxul and am confident that they should now be quite a bit more insulated than previously when they were in physical contact with the scorching hot steel of the inner cover. I carefully used regular silicon to "cement" a number of 4x8 inch tiles around the inner and outer perimeter of the outside cover. Inside, I just did a perimeter around the outer perimeter. The inner one was covered by the original steel. 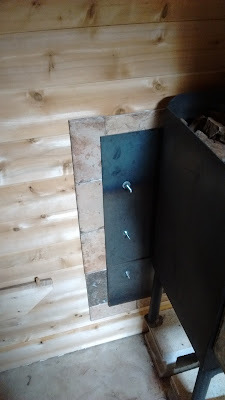 Then, with Kenny and Grandpa's help, we replaced the steel covers, and inserted new through bolts (to accommodate the thickness of the tiles) and bolted everything together. I shimmed some tiles here and there with nuts or washers if the steel plate didn't sandwich down on them completely. I purchased the cheapest tiles I could find, and through dumb luck, I feel that they match the shade of the wood very well! The inside view. Perhaps I should cut off the bolts? And outside - a really close match in colour, don't you agree? Here are a few pictures of the finished product - I'm much more confident that I have diminished the damage the hot stove is doing to the cabin now. Next up will be getting back to doing the trim work. My solar pump is still going (strong? Well, perhaps not strong...) and keeping the pond aerated enough for the goldfish to have flourished, after a fashion. Enough chit-chat though, today while I was down at the pond, I realized that they were no longer scattering in fear at my approach, and that gave me a good chance to examine them a bit more closely. Grandpa did point out that he saw a very large, very happy garter snake skulking around the pond midsummer, so perhaps it was enjoying my sushi buffet? In any case, $3.00 for five rather large fish seems like not such a bad deal now. 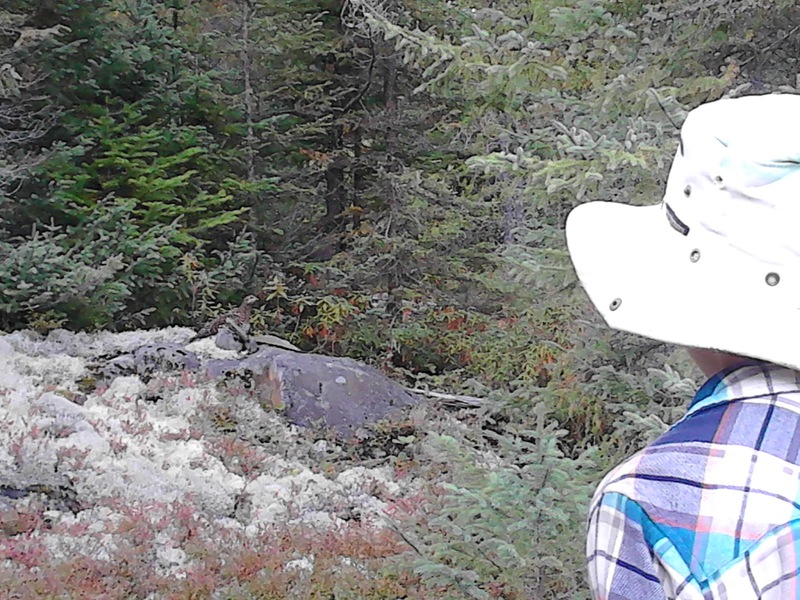 Kenny and Donna and myself often enjoy the excuse to get outside the cabin when we are feeling a bit stir crazy. Keeping tabs on them has become a regular part of our routine. We will see if I can get them to overwinter though... I feel it's unlikely, but I'll make the effort. You can see them congregating at the shore. The four most social I guess. A bit more close up. They look much larger in person! I like the reflection of the nearby pines. 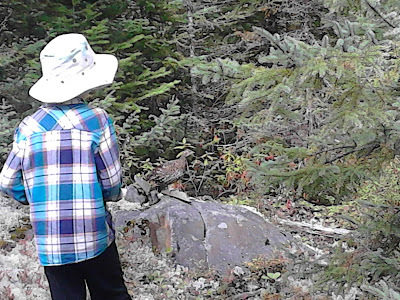 Last week Donna and Kenny managed to get an up close and personal encounter with one of the many Spruce Grouse that seem to think of our property as home. It's always cute to see them with the little ones, but that's not nearly as common as almost stepping on them before we notice them hanging out. After previously updating the stovepipe with a cleanout T, and then using the SootEater to clean out the stovepipe, I decided to literally (a proper use of the word) allow the dust to settle. Today after doing the dishes and starting the laundry (and making the bed and cleaning the spare room), I didn't feel I had time to do a "project" around the homestead before Kenny and I left to do some paid work. Instead, I felt that it shouldn't take hours to remove the ashes that were awaiting me in the bottom of the stove. I found the tub that I had washed my hands in while cleaning the stovepipe, and brought that inside. With the help of the cleaning "hoe" supplied with the Baker's Choice, I opened the front port under the oven door, and began dragging the ashes through it and into the tub. I filled the tub quickly, with not too much ash flying up into the cabin, that was nice, as I didn't have an assistant holding the vacuum for me. With the first tub full, I took it outside and dumped it onto a bare spot of ground a bit away from the cabin. I returned, and half filled a second tub, which got the same treatment. And then the second one maybe half full. With most of the ash pulled out, I decided to stick the ash vacuum right into the access port and give everything a final going over. Spooky landscape under the oven! And a better picture right to the back of the stove. Looks clean enough for me. It was quick work to replace the cover, put away the vacuum, and now I'm ready for the burning season. 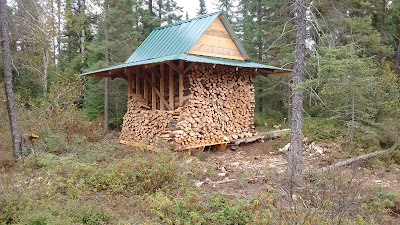 Probably very soon we'll be putting on our fires again - this morning when I got up it was down to about 18.6 in the cabin - it's warmed up about a degree since then, but I don't think we're going to get any more warm enough days to offset the nights that are dropping below 10. Hopefully I can get to some of my other small chores before the snow flies! Bonus picture of a 24' log I brought in for future projects. I'll have to cut it down to 18' just to get it on the sawmill! And I guess we still have iron in the water it seems. 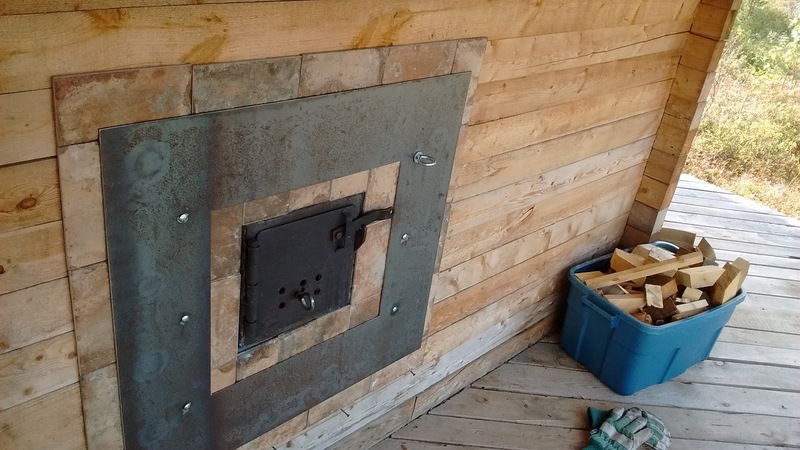 Cleaning the Woodstove From the Bottom Up - A SootEater Review? With the new T added to the stovepipe, and drop cloths still in place, it made sense to jump right in and clean out the stovepipe. Laying out the SootEater and hooking up the first section. I found a thick plastic shopping bag and fit it over the side junction of the T connector. I strapped that with a couple of rubber bands and cut a small hole in the bottom of it to accommodate the SootEater. With one rod in the chimney, I hooked up the drill, Donna held the vacuum nearby and we both switched on. I slowly inserted the rod fully through the bag, and up the chimney. Almost got the first rod in. The first rod didn't go too badly. Not really any ash came out of the bag, and the rod went up the stovepipe easily. I was pumped! A second rod connected, and still going strong. Why are those gloves just laying there? Each rod after that seemed to dislodge more and more fine black powder. The vacuum took care of by far most of it, but my hands did turn black by the time I felt I hit the cap. Kenny rushed outside to take some pictures and confirm that I was at the end. Luckily it happened when it did, as I had hooked up the last of my eight rods! You can just make out the whips in this zoom picture. I kept the drill running and I brought the SootEater back down, removing the rods one at a time, and carrying them directly outside and depositing them on the driveway. Yuck, a bit dirty. Straight outside with you! 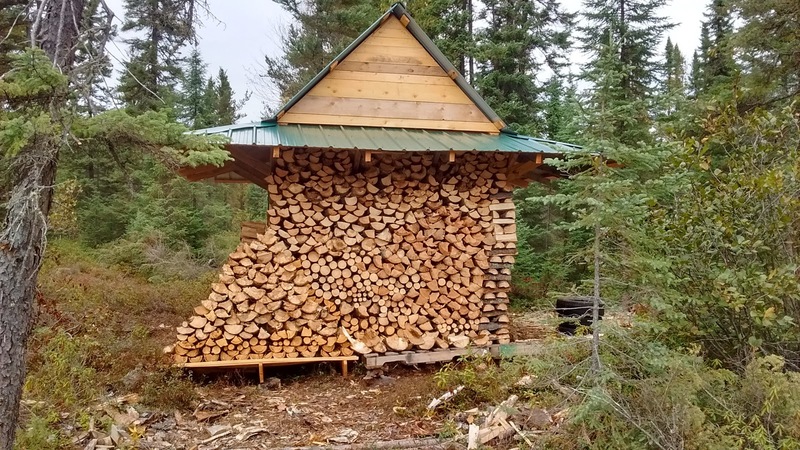 When I got down to the final rod, I folded everything over and pushed it down into the back of the stove while running it, to help dislodge anything that may have been back there. At last, I brought it up, and took off the plastic bag, wrapping it around the whip head of the SootEater and taking it too out to the driveway. Donna vacuumed out the dust that had settled on the lip of the T. I examined the length of stovepipe that I had removed to install the T and measured the amount of ash inside it. The peak thickness was about 5mm - it was grey and easily removed. Not sure if this was a tremendous danger or not? Any chimney sweeps who can give me guidance? Lots of dust settled in the lip of the T.
Maybe 5mm or a quarter inch of ash inside - should I be worried? Just spinning it with my hands, I ran the SootEater up and down the length of this pipe and cleaned it back to bare metal quite easily. I felt reasonably sure it had done a good job inside my cabin. For interests sake though, I stuck the camera into the pipe and tried to take a couple of photos. I then wiped down the rods and put them away. I scrubbed my hands in a tub on the porch, and then installed the cover on the end of the T.
Scrubbing up, not for the last time today. A quick cleanup, and we're ready for the next burning season - and I didn't have to go up on the roof! Another view just inside the T.
Nice and tight cap installed.